The pupils at William Penn Primary School in Coolham took part in a Sussex Green Living Green Day to launch a special recycling scheme at the school. This scheme will allow the children, their families, the teachers, anyone in fact, to recycle materials which would otherwise have to go to landfill and in return the school will receive money. It is a win win situation for the planet and the school! The recycling scheme and Green Day was initiated and presented by Carrie Cort, the marketing director from Take One Productions, a video and digital media company based in Horsham. 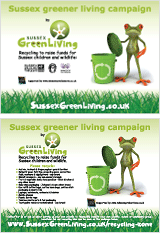 This award winning green initiative www.SussexGreenLiving.co.uk is a children’s green club and a website full of resources, tips and links to really informative sites. Through the website a growing network of like-minded Sussex residents are sharing the “greening journey” and help to spread the word about what people can do to live more sustainably. Carrie delivered an assembly explaining from an environmental point of view why we must recycle, reuse and reduce our demands on the planets natural resources. 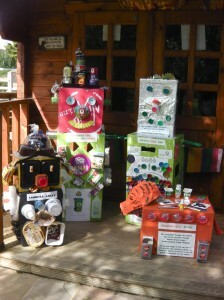 She introduced the Sussex Green Living recycled robots which illustrate what can and can’t be recycled. These robots were left at the school for the week for the children to study. 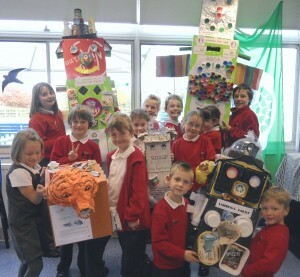 Four days later, pupils participated in the Green Day which included a recycling memory quiz to check they had studied the robots and understood what can and can’t be recycled, recycling races, making Christmas cards for their family out of recycled material, planning and designing a Sussex Greener Living recycling flyer which was emailed to the parents and carer. The day ended with a presentation by the oldest children to parents. Sussex Green Living was launched earlier in the year. Carrie explains how it came about: “As a company we decided we wanted to have more social purpose. “We had carried out a lot of work in the environment, land based industries and educational sectors so this seemed the perfect way to do more”. Carrie closed by saying “My main message to the children during this Green Day was there is no such thing as rubbish, just waste resources in the wrong place. The children have agreed to go out and spread the word about how we can all make a difference in building a more sustainable future”. Materials which can be recycled include: Activia, Actimel and Shape yoghurt pots and bottles, sweet biscuit wrapper, toothpaste tubes, toothbrushes, biros, felt pens, baby wipe packaging, Ella’s Kitchen fruit and vegetable pouches for babies, Eco Refill coffee bags, Tassimo plastic pots and outer foil packaging for coffee, tea and chocolate drinks, plastic bottle tops (with 2 or 4 stamped on them), mobile phones and laptops. Members of the public can also recycle for the Sussex Greener Living recycling schemes and financially benefit the William Penn Primary School. This entry was posted in Eco School Sussex blogs, Eco School William Penn. Bookmark the permalink.